"We took this action based on new reports of Tweets and videos posted yesterday that violate our abusive behavior policy, in addition to the accounts' past violations," the social media company said. 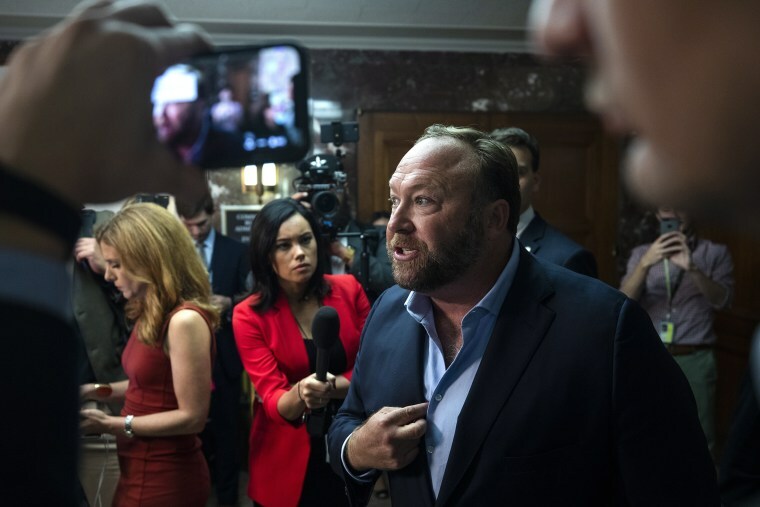 Twitter announced Thursday that it had banned the accounts of conspiracy theorist Alex Jones and his far-right media company Infowars because of "abusive behavior" on the platform. "Today, we permanently suspended @realalexjones and @infowars from Twitter and Periscope," the company tweeted on Thursday. "We took this action based on new reports of Tweets and videos posted yesterday that violate our abusive behavior policy, in addition to the accounts' past violations." Infowars did not immediately respond to requests for comment. Jones had approximately 900,000 followers on Twitter, while Infowars had around 430,000. Jones was reportedly banned for posting a video in which he confronted CNN reporter Oliver Darcy, an exchange in which he insulted Darcy's appearance. In a video posted to the Infowars website, Jones claimed he was banned for being willing to "speak the truth." "I was taken down not because we lie but because we tell the truth and because we were popular," Jones said. "And then when we ran into Oliver Darcy, who is the secret police captain, who admits he goes around and gets people like Infowars taken off other platforms, because we confronted that monster that has abused us and lied about us, attacked our speech, because of that they took us down." This latest ban comes only a few weeks after Jones was similarly kicked off Facebook and YouTube. Apple also removed Jones and Infowars' podcasts from its platform. Twitter, meanwhile, only put Jones and Infowars in a "time out" for a week. Twitter slapped Jones with the temporary suspension in mid-August, preventing him from using his personal account after he encouraged his followers via a video embedded in a tweet to get their "battle rifles" ready against members of the media and other groups. With the ban from Twitter, Jones has now effectively been "deplatformed" by all major social media companies. While Jones is still active on some far-right websites, the bans had already taken their toll before Twitter acted. An analysis of data by The New York Times found that Jones' audience had roughly been cut in half by the bans from Facebook and YouTube. Twitter said that it typically does not comment on enforcement actions, such as bans and suspensions, but it decided to comment on Jones' case because "we wanted to be open about this action given the broad interest in this case." The social media company said they would continue to monitor reports of abuse from other accounts associated with Jones and Infowars. Jones made a surprise appearance in Washington on Wednesday, and sat only a few feet behind Twitter CEO Jack Dorsey as he testified before the Senate Intelligence Committee. Dorsey also testified before the House Committee on Energy and Commerce. Twitter faced mounting pressure as critics believed that the platform allowed Jones to spread misinformation, most famously the falsehood that the 2012 massacre at Sandy Hook Elementary School had been staged. Jones is facing multiple defamation suits from parents of the murdered children. Families like Nelba Marquez-Greene's have faced persistent harassment by internet trolls in the years since Jones pushed the conspiracy theory that the Sandy Hook Elementary School shooting was a hoax. Marquez-Greene's 6-year-old daughter Ana was shot and killed in the shooting. While Marquez-Greene applauded Twitter's suspension of Jones, she said she still finds enforcement of those behind dangerous harassment campaigns on social networks to be inconsistent. "What's disconcerting, although the victory is great, is the randomness of the application of rules," Marquez-Greene told NBC News. "I hope that we can get to a place in society where it doesn't have to happen to you in order for it to be meaningful. Many people who are subject to these violations have much less power than heads of companies and reporters." Outside the hearing on Wednesday, Jones told reporters that the Democratic Party, multinational corporations and the tech industry were conspiring to silence "conservative and nationalist and populist voices ahead of this critical midterm election." "I'm here to be able to face my accusers," Jones declared. "This is the 11th hearing they've had where they make up all these incredible lies about me and others to sell the end of the First Amendment." Dorsey has consistently championed free speech principles, however, and Twitter had previously been hesitant to ban accounts for even extreme hate speech — something that has changed in recent years. In October 2017, Dorsey promised new rules on Twitter in an effort to crack down on hate speech and threats. Dorsey, apparently nonplussed by Jones' presence, addressed these concerns of censorship on Wednesday before the Senate Intelligence Committee. "Twitter does not use political ideology to make any decisions, whether related to ranking content on our service or how we enforce our rules," he said in prepared remarks. When Dorsey departed the building, Jones followed him outside to his car and began to yell at him — though it is unclear what Jones said. Jones also confronted Sen. Marco Rubio, R-Fla., outside of the intelligence committee meeting, as Rubio was talking to reporters. The senator eventually gave up on answering questions and told reporters, "you guys can talk to this clown." Meanwhile, mothers like Marquez-Greene just hope that Jones' ban will prevent similar hoaxes and harassment campaigns from popping up in the future. "My hope is that in the next incidents of mass violence, fewer families will have to deal with this on top of burying a loved one," she said. "This isn't, for me, about Alex Jones. This is, for me, about trying to lift up families."